The prehistoric area of Saint Martin de Corléans, in Val d'Aosta, contains one of the greatest concentration of megalithic monuments in Italy. They were discovered in June, 1969, and are spread over an area of over one hectare (10,000 square metres, or about 108,000 square feet), which is crossed by a city road. The monuments at Saint Martin de Corléans, which date back to the 3rd millennium BC, indicate that it was a very important place for over a thousand years. Its location was probably due to its proximity to two important mountain passes and several metal deposits. The construction of the site began between 3000 and 2750 BC, with the planting of a series of wooden poles. Before this planting, the ashes of burnt ox skulls were spread at the bottom of the pits that held the poles. The various rows of poles are aligned towards a rock on the mountain in front of the site. The most likely explanation for this alignment is that the ancient inhabitants of the valley noticed that the rock in question just hides the Moon on the rare occasions when it dips to its lowest angle below the celestial equator. The second phase (2750-2400 BC) started with an extensive ritual ploughing, whose lines are parallel to the orientation of the wooden poles. The ploughed area yielded a large number of human teeth, apparently planted as though they were seeds. Several statue-stele (human figures carved on big stone slabs) were also erected in the same period. Some of these were aligned with the poles and the ritual ploughing, while others were set at right-angles to the alignment. In addition, a number of standing stones, stone platforms and at least seven big ritual pits were added during the same construction phase. The third phase, between 2400 and 2100 BC, saw the construction of a big dolmen (2.5 x 2.2 m, or about 8.2 x 7.2 feet) with a side entrance and a 15m (49 feet) triangular stone platform, followed by a second smaller dolmen, an allée couverte (a tomb that looks like an elongated dolmen) and a circular tomb. All these monuments were left without a covering mound, just like the Caucasian and Palestinian tombs. The tombs at Saint Martin de Corléans are usually aligned to local astronomical points, in particular the sunset at summer solstice and the moonset when the Moon reaches its northernmost position. 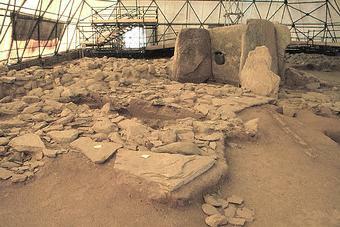 Several smaller tombs were built during a fourth construction phase (2100-1900 BC). The site was then deserted for about 700 years, but from 1200 to 800 BC was again used as a burial ground.